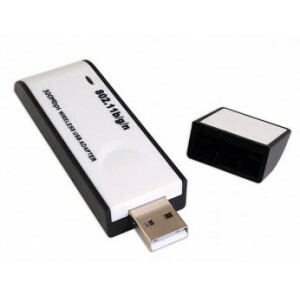 The VGA to TV converter lets you connect the VGA output of your PC/Laptop to any CRT TV, LCD TV, Plasma TV or VCR via the composite video input or S-Video input. Many modern laptops and desktops come with high-end video cards that natively support composite video output from the VGA connector. For these systems, all you need is a simple adapter cable that connects the composite output to the correct pins on the VGA connector. Unfortunately, many older computers and even modern budget computers often don’t. My Giada N10 Nettop PC, that I use as my media centre, does not have a composite video output. Before I purchased my HDMI-equipped Samsung 55″ LCD TV, I needed to convert the VGA output to a composite video output to I could use it on my old TV. After I got my new TV, one of my HDMI cables was bad, so using this converter, I was able to diagnose the problem with the cable using my old TV. Also, I once had to give a Powerpoint presentation in an old pub that had a broken projector, using someone else’s old laptop. Using the converter, I was able to connect it to the pub’s big old CRT TV and finish my presentation. 1280×1024 at a refresh rate of 60Hz. 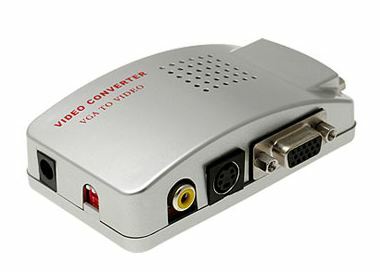 The VGA to TV converter also has a pass-through VGA output port, so you can simultaneously view the computer screen on your regular VGA monitor while viewing the video on your TV or projector. In fact, all three video outputs are active at the same time, so if you wanted, you could connect the device simultaneously to a VGA monitor, a TV composite input and a VCR S-Video input. It supports both PAL and NTSC video standards, with overscan and underscan display modes to fit more lines on the screen. 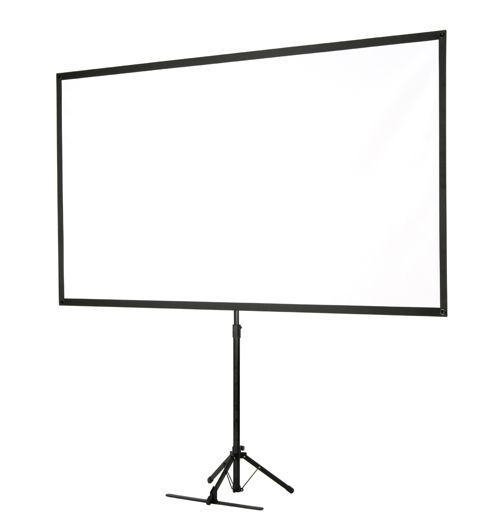 It has an intelligent On-Screen Display (OSD) with simple push-button controls to adjust the vertical and horizontal size, position and the colour settings. It draws its power from a spare USB port, but you can connect it to any 5V supply or a dedicated mains USB charger, like those that you use to charge iPods and MP3 players. This is useful for multi-screen games, or people who do image or non-linear video editing. The TV can be used for queuing video clips and testing effects. You will need a video card that supports multiple monitors (most modern nVidia and ATI video cards do), or you’ll need to add an extra video card to your PC. Don’t laugh. You may be in a situation where you need to show someone a presentation or video on old VCR equipment, e.g. if travelling overseas or going to an underdeveloped country, or simply if you find yourself in a situation where nothing else works! 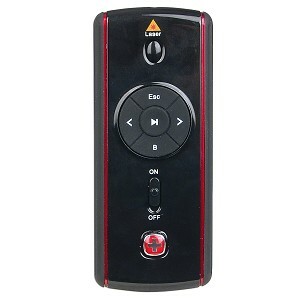 On the market, there are 2.4 GHz and 5.8 GHz Video Transmitter/Receiver devices that designed for people who want to transmit from their cable TV decoder box to a TV in another room. 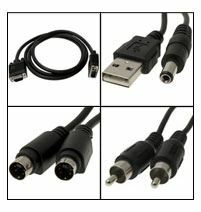 You can also use these devices for transmitting from a PC to a TV in another room. Just connect the S-Video or Composite output of the Converter box to the transmitter. If your TV is so old that it doesn’t have a composite video input, you use the universal RF modulator together with th VGA to TV signal converter box to solve this problem. Yep, the Universal RF modulator is effectively a UHF TV transmitter. If you are good with electronics and have a directional antenna, you could possibly even amplify the signal and create your own mini analogue TV station, with all programming controlled from your PC. Make sure that you read up on the local laws in your area regarding unlicensed radio transmission to ensure that you are not effectively running a ‘pirate’ TV station, which could get you into trouble. Just buy a new goddamn computer! Just buy a new goddamn gadget! 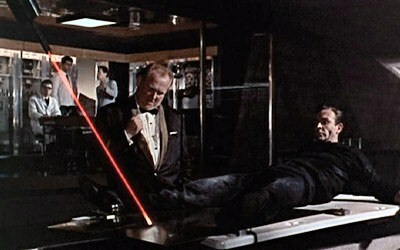 Seriously where’s my new goddamn gadget? There will be heaps of new gadgets shortly. I promise. As always, I look forward to your future feedback. Every new TV has both HDMI and VGA inputs these days. But I agree there are probably heaps of old TVs kicking around that could find new life as low-res fuzzy monitors displaying 40 column Vic-20 fonts. Well, I think the Bloomberg financial channel is a brilliant example showing how much info you can pack in at Analogue TV (PAL/NTSC) resolutions. I refer to your previous point on the Bloomberg channel. The other day a colleague and I were having a discussion about that very thing – the layout and content of the channel. I, like you, believe it to be great use of screen space, and he did not. Needless to say we got in quite a big argument over this. I can’t remember his exact words because I was so infuriated but it was something along the lines of “bag of day old dicks”. I can’t talk to him anymore about the Bloomberg channel. How’s the goddamn gadget adventures coming along? Thank you for fixing my spelling mistake! I wanted to repay your kindness with some suggestions to spice up the VGVs (Vlad’s Gadgets Visuals). You can see my mockup at http://bit.ly/a9wK0J hope you like it! Happy to oblige – I knew that you intended to spell it correctly. I am looking to replace the theme for Vlad’s Gadgets, so I applaud the effort you made to create this mockup. I like having a background and changing the text fonts. I like circuits myself, but it might give the reader the impression that we only discuss electronics, which is not the case – we cover all kinds of gadgets. However, a circuit background might be able to be applied selectively to posts that concern electronics. I am not so much a fan of the bright, garish green solid background behind article text, and the spinning icons. I understand that the purpose of that site is to “transform” a site into what it would look like, had it been hosted on the defunct Geocities web hosting service. That probably explains my opinion. To anyone else reading, I am prepared to pay good Australian money to someone who can design a kickarse theme replacement for Vlad’s Gadgets. Please use the feedback form if you are interested, and explain your artistic credentials. If it makes it easier, I have a software licence to use the WordPress Thesis theme framework. I have noticed that quite a long period of time has passed between gadget reviews. While there are a most likely a number of reasons for this (busy, kidnapping, conscription etc), I have come to the conclusion that you are out of ideas for gadgets. Would you be interested in taking reader suggestions for new gadget reviews? Recently I have been very curious about the “Tower 200” exercise product and thought that this would be a good gadget candidate for you as you seem to have a keen interest in keeping in shape and maintaining an outside beauty to which society is accustomed to. On a side note I also find the TV commercials for this product to be quite good. I don’t know if you’ve ever thought about advertising your blog on TV but I think these ads would be a good starting point. Very informative! Good luck and safe gadgeting.